It’s not your imagination. Spring really did come late to Brooklyn this year. We experienced a bit of a roller coaster in April, with some very cold days, record-breaking snow, and a few balmy warm days, but on average we were several degrees below the typical April. How does this occurence fit in with more general climate change patterns? Most of North America east of the Rockies was frigid this spring. Many states in the northern Great Plains and Midwest had one of their three coldest Aprils, and New York State experienced its fifth-coldest April on record. The Rutgers Global Snow Lab ranks April 2018 in the top five for the extent of snow across North America since 1981. However, the opposite is true at the global scale: Our region was the outlier compared with the rest of the world, which experienced its third-hottest April on record! Using the bloom time of the trees on Brooklyn Botanic Garden’s Cherry Esplanade as a rough metric for the arrival of spring, New York City was about a week and a half behind the recent norm. Peak bloom for most of the pink-flowered cherries (Prunus ‘Kanzan’) was May 4. Last year, it was more like April 22, and in 2016, it was April 24. In Washington, DC, the cherry blossoms in the Tidal Basin were also behind their historical peak—about five days. 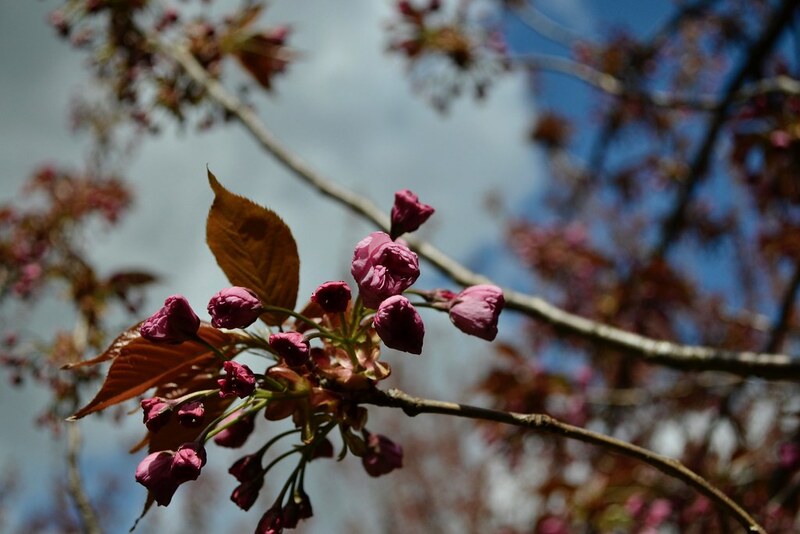 Trying to predict when the cherry blossoms will bloom has become a sort of sport in both DC and New York, but historical bloom times are also valuable data for scientists studying the effects of climate change. Phenology, the study of the timing of biological events—like leaf-out and bloom times of plants and migration and hibernation of animals—is a discipline originally used for agriculture, but its applications have since broadened. The USA National Phenology Network (USA-NPN) produces comprehensive seasonal change indexes and maps using temperature along with bloom and leaf times of three representative plant taxa: a cloned lilac cultivar (Syringia × chinensis ‘Red Rothomagensis’) and two cloned honeysuckle cultivars (Lonicera tatarica ‘Arnold Red’ and L. korolkowii ‘Zabelii’). What phenological trends has the group found this year? For a large regional band, of which NYC is on the southern edge, spring came late. The was also true for most of the southeastern U.S. But the national map is complicated. Just to the south of us, for example, the region encompassing southern New Jersey down through parts the Carolinas and Georgia experienced an early spring. Climate scientists base their estimates and predictions of phenological transitions largely on accumulated temperatures over a few months, as measured by growing degree days (days on which the temperature rises above a particular baseline, usually 65°F, with more weight given to warmer days), along with weather events (for example, rain showers in the desert or cold snaps in moist regions like ours). Weather events in turn are largely driven by prevailing atmospheric circulation patterns: the movement of high and low pressure systems at the earth’s surface and the jet stream in the upper atmosphere. This variability in atmospheric circulation may be responsible for the “weather whiplash” the Garden’s Horticulture staff has noticed in recent years, in which early blooms appear during an unseasonable warm spell only to get hit with a subsequent hard freeze. In any one year, the spatial and temporal patterns of spring onset over a large region vary a lot, but you might expect the long-term trends to be consistent across the continent. What better place to test this hypothesis than the national parks, which are scattered across all regions of the country? Several years ago, scientists from the National Park Service and their colleagues at other institutions analyzed records of first leaf and first bloom for a period of 112 years ending in 2013. When vegetation is affected by the climate, there is a ripple effect on wildlife. Over the past decade, members of BBG’s staff have noted more southern species of insects and birds in the Garden and seen some migratory birds arriving earlier. Research has found similar trends. One study found that the arrival of many North American migratory bird species at their breeding grounds is diverging from local spring green-up times. Many bird species’ migrations are cued by photoperiod (seasonal changes in sunlight) rather than temperature, and though there has been a shift in some birds’ patterns, not all species are keeping pace with regional green-up, some birds arriving too early and some too late for optimal feeding and breeding conditions. This mismatch could threaten their health and survival as well as that of future generations. Early green-up can also threaten the long-term health of plants. Abnormally early leaf-out can leave trees vulnerable to spring frosts. In the Northeast in 2010, spring temperatures were more than 5°F above average. That triggered sugar maple trees to leaf out two weeks earlier than normal. Then a late-spring frost came along and defoliated these trees, greatly reducing their growth that year. There is also evidence that earlier spring leaf-out can result in earlier leaf drop in the fall. Scientists are still unsure how all of these complex relationships will play out as the climate continues to change, often in unpredictiable ways. Improved computer simulations in recent years suggest that as the century progresses, earlier leaf-out may be expected across temperate and boreal deciduous forests. Phenological studies of plants and animals in the wild will help experts like ecologists, conservationists, and farmers understand how to adapt and remain resilient in the face of the changes that lie ahead. Andrew Reinmann is an ecologist in Department of Geography, Hunter College, City University of New York; and the CUNY Advanced Science Research Center. Can you explain what happened to the linden trees throughout Park Slope this year? The blossoms appeared but seem to shrivel and dry up before giving off any of their typically beautiful scent. Related to climate change? 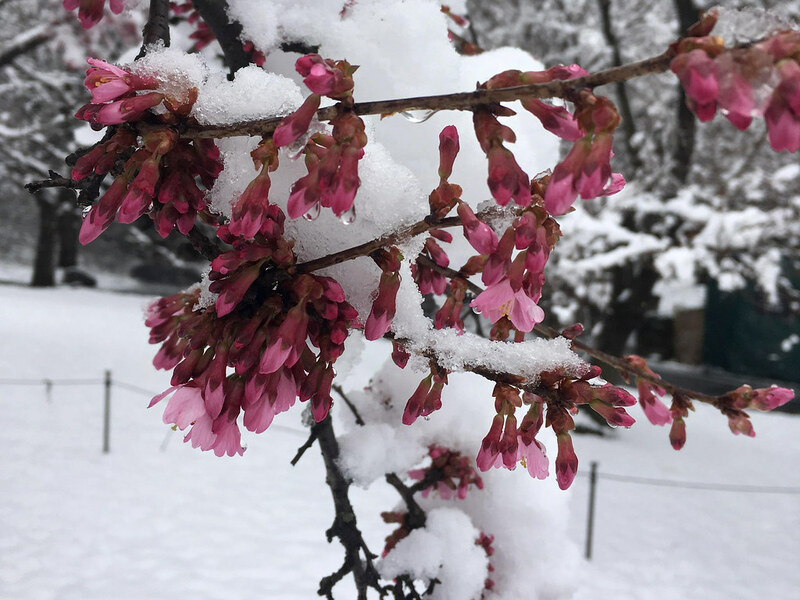 The early blossoms of an 'Okame' flowering cherry cultivar, blanketed in snow. Photo by Ruiyan Xu. 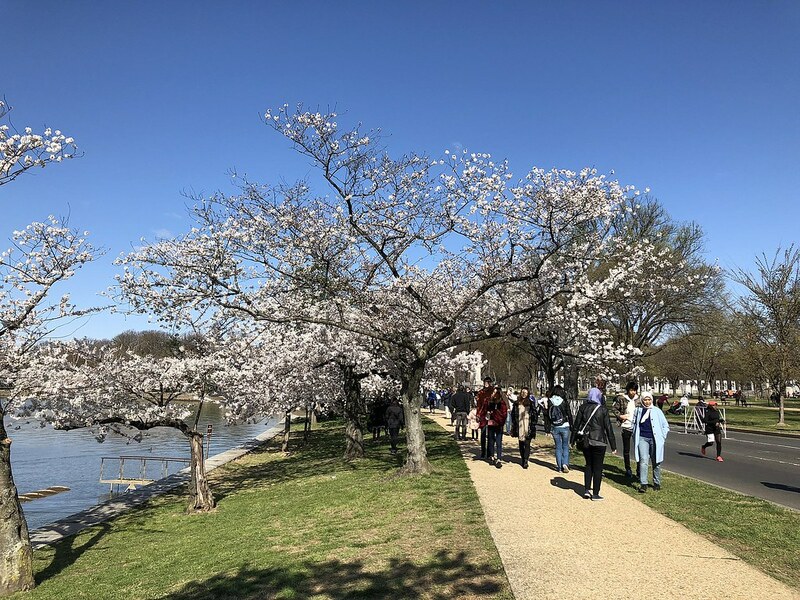 Yoshino cherries blooming along the Tidal Basin on April 8 during the 2018 Cherry Blossom Festival. In Washington D.C. bloom times were about five days behind their historical average. Photo by Famartin. Sakura Matsuri, April 2018. The kanzan cherry trees had not quite bloomed during this year's festival. Photo by Blanca Begert. 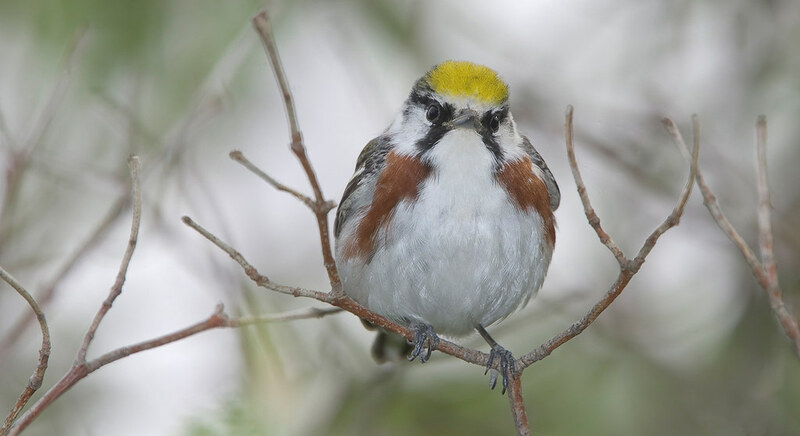 Spring arrival time for many eastern migratory birds, like the chestnut-sided warbler (Setophaga pensylvanica), is starting to lag behind green-up. Photo by William H. Majoros.